Solution of triangles (Latin: solutio triangulorum) is the main trigonometric problem of finding the characteristics of a triangle (angles and lengths of sides), when some of these are known. The triangle can be located on a plane or on a sphere. Applications requiring triangle solutions include geodesy, astronomy, construction, and navigation. Two sides and an angle not included between them (SSA), if the side length adjacent to the angle is shorter than the other side length. A side, the angle opposite to it and an angle adjacent to it (AAS). Three angles (AAA) on the sphere (but not in the plane). For all cases in the plane, at least one of the side lengths must be specified. If only the angles are given, the side lengths cannot be determined, because any similar triangle is a solution. The standard method of solving the problem is to use fundamental relations. There are other (sometimes practically useful) universal relations: the law of cotangents and Mollweide's formula. To find an unknown angle, the law of cosines is safer than the law of sines. The reason is that the value of sine for the angle of the triangle does not uniquely determine this angle. For example, if sin β = 0.5, the angle β can equal either 30° or 150°. Using the law of cosines avoids this problem: within the interval from 0° to 180° the cosine value unambiguously determines its angle. On the other hand, if the angle is small (or close to 180°), then it is more robust numerically to determine it from its sine than its cosine because the arc-cosine function has a divergent derivative at 1 (or −1). We assume that the relative position of specified characteristics is known. If not, the mirror reflection of the triangle will also be a solution. For example, three side lengths uniquely define either a triangle or its reflection. Then angle γ = 180° − α − β. 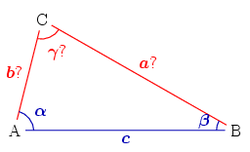 Some sources recommend to find angle β from the law of sines but (as Note 1 above states) there is a risk of confusing an acute angle value with an obtuse one. 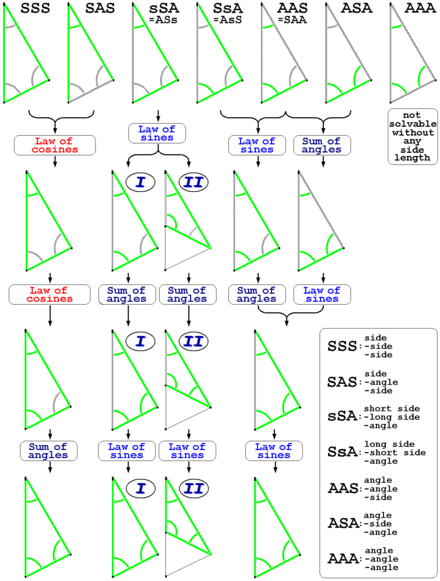 Another method of calculating the angles from known sides is to apply the law of cotangents. Finally, β = 180° − α − γ. If D > 1, no such triangle exists because the side b does not reach line BC. For the same reason a solution does not exist if the angle β ≥ 90° and b ≤ c.
If D = 1, a unique solution exists: γ = 90°, i.e., the triangle is right-angled. If D < 1 two alternatives are possible. If b ≥ c, then β ≥ γ (the larger side corresponds to a larger angle). Since no triangle can have two obtuse angles, γ is an acute angle and the solution γ = arcsin D is unique. 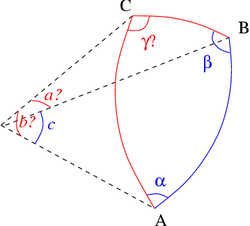 If b < c, the angle γ may be acute: γ = arcsin D or obtuse: γ′ = 180° − γ. The figure on right shows the point C, the side b and the angle γ as the first solution, and the point C′, side b′ and the angle γ′ as the second solution. Once γ is obtained, the third angle α = 180° − β − γ. 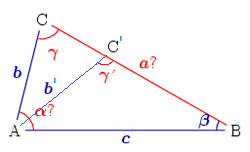 The known characteristics are the side c and the angles α, β. The third angle γ = 180° − α − β. The procedure for solving an AAS triangle is same as that for an ASA triangle: First, find the third angle by using the angle sum property of a triangle, then find the other two sides using the law of sines. Spherical geometry differs from planar Euclidean geometry, so the solution of spherical triangles is built on different rules. For example, the sum of the three angles α + β + γ depends on the size of the triangle. In addition, similar triangles cannot be unequal, so the problem of constructing a triangle with specified three angles has a unique solution. The basic relations used to solve a problem are similar to those of the planar case: see Spherical law of cosines and Spherical law of sines. where the signs of the numerators and denominators in these expressions should be used to determine the quadrant of the arctangent. As for the plane case, if b < c then there are two solutions: γ and 180° - γ. The above algorithms become much simpler if one of the angles of a triangle (for example, the angle C) is the right angle. Such a spherical triangle is fully defined by its two elements, and the other three can be calculated using Napier's Pentagon or the following relations. 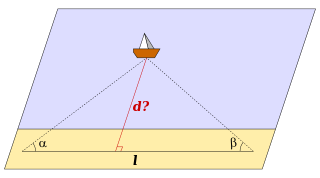 If one wants to measure the distance d from shore to a remote ship via triangulation, one marks on the shore two points with known distance l between them (the baseline). Let α, β be the angles between the baseline and the direction to the ship. This method is used in cabotage. The angles α, β are defined by observation of familiar landmarks from the ship. Here R is the Earth's radius. ^ "Solving Triangles". Maths is Fun. Retrieved 4 April 2012. ^ "Solving Triangles". web.horacemann.org. Archived from the original on 7 January 2014. Retrieved 4 April 2012. ^ "Solving SSS Triangles". Maths is Fun. Retrieved 13 January 2015. ^ "Solving SAS Triangles". Maths is Fun. Retrieved 13 January 2015. ^ "Solving SSA Triangles". Maths is Fun. Retrieved 9 March 2013. ^ "Solving ASA Triangles". Maths is Fun. Retrieved 13 January 2015. Euclid (1956) . Sir Thomas Heath (ed.). The Thirteen Books of the Elements. Volume I. Translated with introduction and commentary. Dover. ISBN 0-486-60088-2. Trigonometry by Alfred Monroe Kenyon and Louis Ingold, The Macmillan Company, 1914. In images, full text presented. Google book. 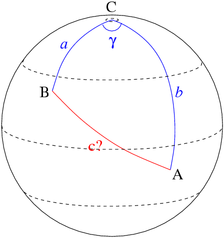 Spherical trigonometry on Math World. Spherical Trigonometry — for the use of colleges and schools by I. Todhunter, M.A., F.R.S. Historical Math Monograph posted by Cornell University Library. Triangulator – Triangle solver. Solve any plane triangle problem with the minimum of input data. Drawing of the solved triangle. TriSph – Free software to solve the spherical triangles, configurable to different practical applications and configured for gnomonic. Spherical Triangle Calculator – Solves spherical triangles.